Check out the perfect Christmas gift for you all Twi-hard friends! 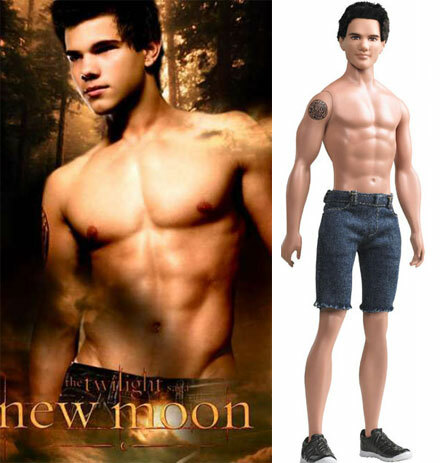 A new doll addition to the Twilight dolls family is a shirtless doll of Jacob Black. It looks a lot like Taylor Lautner, but in its doll way, of course. Still, Taylor’s shirtless body looks a lot hotter than the doll’s. According to the source, you can get this doll for just $24,95. Do you think the doll is worth it? In related Taylor news, New Moon stars, Lautner, Robert Pattinson and Kristen Stewart, made an appearance on Jimmy Kimmel Live! last week with the show airing tomorrow night. During the interview, Taylor talked about bulking up for the movie and how hard it was to “put something” in his mouth every two hours. The audience’s reaction was hilarious! Countdown to New Moon – IT’S TOMORROW!! !